The Sergeant Newton Chapter of the National Society Daughters of the American Revolution (NSDAR or DAR) honors Sergeant John Newton for whom Newton County was named. Sergeant Newton became a hero by recapturing American prisoners of war near Savannah, Georgia, during the American Revolution. Covington, the county seat of Newton County, is in the heart of Georgia's historical section. A walk around the square can take you back to life as it was at the turn of the last century. 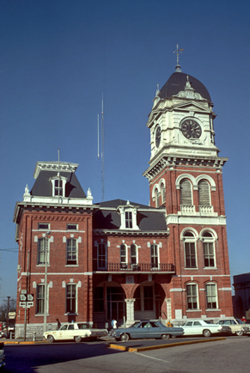 The courthouse, built in 1885, located on the northwest corner of the square, is probably one of the most recognizable buildings in the country. In the blocks adjacent to the square, there are homes and churches also built in the nineteenth century. The city government and citizens are supportive of the area's historical importance. The Newton County Library has an excellent Genealogical Section. Chapter members have donated valuable books to that section and even work volunteer hours there aiding those seeking information. The Sergeant Newton Chapter has recently reactivated a youth group called, Children of the American Revolution (C.A.R.). Historical activities for young people are the primary focus.